We are a “chamber orchestra”, which simply means that we are a bit smaller than, say, a “symphony orchestra”. The word “chamber” of course implies a room, and in fact the history of the chamber orchestra as an ensemble goes back to the small ensembles European aristocrats had at their disposal for personal entertainment. A modern symphony orchestra might have 80-100 players, and the usual chamber orchestra about 50. 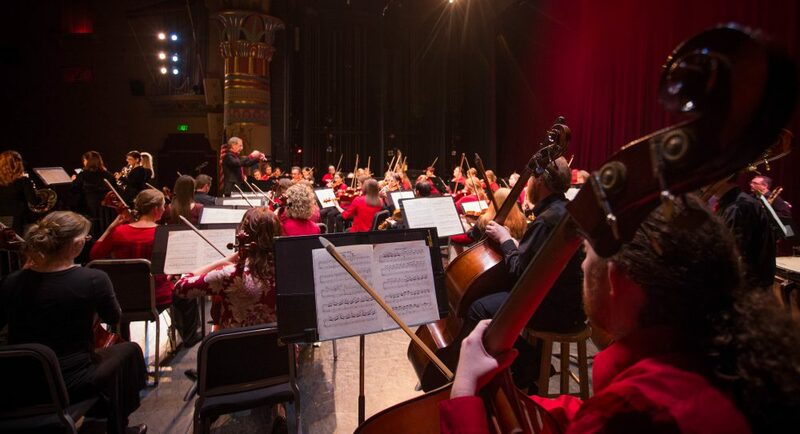 Orchestras in general are divided into four sections: strings, woodwinds, brass, and percussion. The strings are divided further into first violins, second violins, violas, cellos, and basses. The strings generally work as a team with a homogeneous sound, and the section contains instruments of varying sizes covering the higher register (violins) all the way down to the lowest register (basses). The woodwinds sit behind the strings and are made up of flutes, oboes, clarinets, and bassoons. In contrast to the strings, the woodwinds vary in sound, due to variety in means of sound production. This creates a rich, colorful heterogeneous sound equally capable of supplying melodies or harmonies as the composer sees fit. Like the strings, the woodwind group covers the highest register (flute) down to the lowest (bassoon). The brass section in a chamber orchestra typically consists of pairs of trumpets and horns. A symphony orchestra might add to that another trumpet, two more horns, three trombones, and a tuba. The brass are another homogenous-sounding group often used for dynamic punctuation. The percussion section can vary wildly in make-up, but at a minimum usually consists of tympani (also called kettle drums). Tympani are tuned to a specific pitch, and help reinforce the bass notes of a composition. Other percussion, such as snare drum, bass drum, triangle, etc. are used for particular coloristic effect or to reinforce the rhythmic drive of a particular passage. The conductor’s job is to help hold the entire ensemble together by providing central leadership, encourage particular types of expression through his/her gestures, and to control balance, tempo, and overall volume of the ensemble on-the-fly.